Watch India vs West Indies 2014 Kochi 1st ODI live online streaming on websites and TV channels. Get India vs West Indies 2014 Kochi where to watch live, preview, ball to ball commentary, live streaming information and team news. 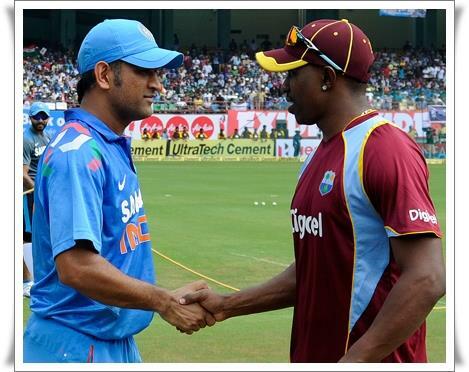 The live match between India and West Indies will be telecast on Sky Sports and online streaming on BCCI website. Read more to know about the 1st ODI at Kochi International Nehru Stadium. Kochi International Nehru Stadium is all set to host the 1st ODI of the 5 match series between India and West Indies. Being arch rivals in this sport event, the match between the two teams will always promises plenty of excitement and thrills on the field. The Indian team is thickly packed with hard hitters while West Indies believe in the power of their bowlers. The stadium will be immensely packed with cricket enthusiasts who would cheer for their home team celebrating each moment of cricketing action. Ajinkya Rahane will open the batting for India alongside Shikhar Dhawan. Rahane who had made an impressive show in his career looks forward to add extra mileage to the match with his performance. Other key players to watch are Virat Kohli, Suresh Raina, MS Dhonil, Ravindra Jadeja and Ambati Rayudu. Kohli has done a decent performance in the limited-over's game over the past couple of years. Ambati Rayudu would be a real asset in the middle order for India. The team also believes in the bowling department which includes Amit Mishra, Kuldeep Yadav, Bhuvneshwar Kumar and Umesh Yadav. Kuldeep made some impressive spell for the Kolkata Knight Riders in the CLT20 2014. Amit Mishra also wishes to create his own space in the team and also reduce the gap to the 2015 World Cup squad. Lendl Simmons, Dwayne Smith, Marlon Samuels, Darren Bravo, Dwayne Bravo, Darren Sammy, Andre Russell and Kieron Pollard are clear hard hitters who could deliver nightmares for the Indian bowlers. As few among them play in the Indian Premier League, much is known about strength and weakness. The West Indies expect to take full advantage of the flaw of the Indian bowlers at the death overs. As per schedule, the match to be played at Kochi on 8th October 2014 will start at 2.30 PM IST. Live coverage of the match will be available Star Sports (India), SuperSport (South Africa), SkySports 2 & HD (UK), Willow TV (USA and Canada) and Ten Sports (Caribbean). Ball to ball commentary will be updated on ESPN Cricinfo.